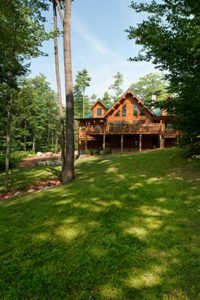 With all the focus on the design and details of your Katahdin Cedar Log Home, it’s easy to neglect planning and budgeting for landscaping. 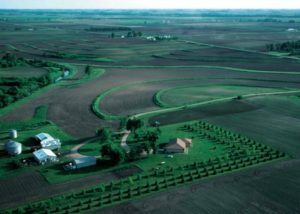 Often the last time a new homeowner thinks about the setting for this major life investment is when selecting the land. But that beautiful spot needs some help recovering from the construction process and planning for landscaping will ensure that your new log home is beautiful from the outside. We spoke with Frank Gioffre, who helped design the landscaping plan around Katahdin’s main office in Oakfield. His log home’s landscaping is a personal passion—one that he thinks about most every day. “When people think about their new log home, often that vision is based on stunning magazine photography,” Gioffre said. Log home enthusiasts collect images and ideas from these glossy log home publications, or on social media websites like Pinterest or Instagram. “What most folks don’t realize is these magazine settings often take years to mature and require some advance planning.” Landscaping budgets never come up and rarely are they figured into the overall budget, he notes. As a practical matter, construction mortgages don’t cover landscaping features which are not considered part of the improvements being financed. However, there are ways to get your home’s landscaping budget started so that you can add to it in the future. Beyond the beauty of plantings and stonework, landscaping performs a function around your log home. Good grading and drainage, combined with healthy native plantings, can control erosion. Erosion control is especially important if your log home is situated on or near a river, lake or stream. Vegetation plays an important role in keeping topsoil in place and out of waterways. Designing in features and paths for water to travel with grading, French drains and other erosion prevention measures can protect the beautiful setting that your home inhabits. 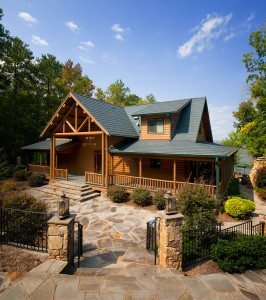 Besides the immediate appeal of trees surrounding your home, the type and location of trees within your log home landscape can enhance your home’s comfort and efficiency. For example, planting deciduous trees along the southern and western exposures can help to keep your home cool in the summer. When winter comes and you’re counting on the benefits of passive solar to help warm your home during the day, leafless beeches, oaks and maples will let the sun shine through! Evergreens can play an insulating role on the side of your home that gets cold winter winds. A row of full evergreens can act as a windbreak and prevent the build-up of snow along driveways or in front of the garage. Follow the natural terrain to create pleasing curves, rather than plotting straight lines for walkways, driveways and hardscaping. We’ve all seen the new house that looks like it was dropped from the sky with no thought to positioning or to fitting the landscape. That’s why talking about options and designs with your Katahdin dealer or representative is important! Those early discussions that include landscaping can prevent against awkward design or positioning and result in a beautiful final result that shines in its landscaping.